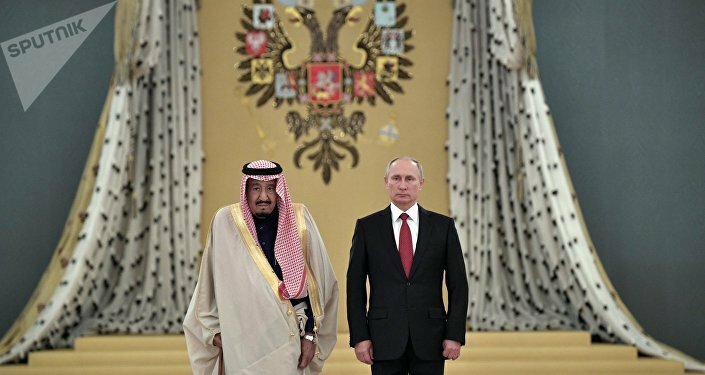 Russia and Saudi Arabia reached agreements on the supply of S-400 anti-aircraft missile systems, as well as Kornet-EM anti-tank missile systems, TOS-1A "Buratino" heavy flame systems, AGS-30 grenade launchers and Kalashnikov AK-103 assault rifles, Russian Federal Service for Military-Technical Cooperation spokeswoman Maria Vorobyova told Sputnik. "We reached an agreement with Saudi Arabia for the supply of S-400 air defense systems, Kornet-EM anti-tank missiles, TOS-1A systems, automatic AGS-30 grenade launchers and Kalashnikov AK-103 assault rifles," she said. She said that during Saudi King Salman bin Abdulaziz Al Saud's visit to Russia last week, Russia's Rosoboronexport state arms exporter and the Saudi Arabian Military Industries (SAMI) had signed a contract to organize the licensed production of Kalashnikov AK-103 assault rifles and ammunition for them in Saudi Arabia. Vorobyova added that Rosoboronexport and SAMI had signed a memorandum on cooperation in the defense industry sector. Earlier, the Bloomberg news agency published information with reference to a press release from the Saudi Arabian Military Industries (SAMI), according to which Moscow and Riyadh signed contracts providing for the purchase of S-400 air defense missile systems.